The strength of temperature variations (vertical) is plotted against their angular sizes (horizontal). 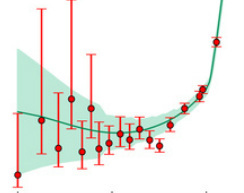 The green line was predicted by current cosmic-origins theory; the red dots are Planck data. The graph above shows the distribution/frequency of various sizes of areas or 'patches' of the sky with similar temperature/density. The standard flat model makes specific predictions about what this graph should look like. (i.e. predicts the size and corresponding number or frequency of patches) For the most part, Planck’s data traces near perfectly that predicated by the model. However, there is one notable anomaly at large scales (the lower left side of the power spectrum graph above, shown in more detail to the left). Further, the range of error for that data falls outside the theoretical prediction envelope. The range of error cannot be determined with 100% certainty. However, the error bar falling completely outside the range predicted would indicate that the probability of the theoretical curve being correct at that particular location of the graph is low. On the other hand, if the graph is shifted to improve the fit and fall within the error bar of the anomalous data point it pulls the balance of the graph off of the other data points it appears to fit so well. The European Space Agency that ran the Planck mission states that this anomaly "might challenge the very foundations of cosmology, suggesting that some aspects of the standard model of cosmology may need a rethink". An infinite flat universe should have produced data points whose error bars all straddled the predicted curve. The curve above is established based on the standard model of physics. To get a better understanding of what this graph represents, it can be compared to measuring the expected size of waves on an ocean. If the ocean is flat and stretching out infinitely in all directions you could predict surface wave lengths based on all of the physical parameters (e.g. viscosity of the water, wind, depth, etc.). If waves having very long wave lengths are predicted but not observed, one might come to the conclusion that the ocean surface is not flat but rather curves back on itself. This is because, although an ocean that curves back on itself would have similar wavelengths to an infinitely flat ocean at the smaller scale, at a larger scale its finite shape would impose limits on the length of waves by way of natural harmonics. For example, on earth a tidal wave with a wavelength 2/3 the length of the earth's circumference would not be possible. Like a bell, all objects of a finite size have harmonics which limit vibrations to discrete wavelengths at larger scales relative to the overall size of the object in question.